The sound of the ocean comes before any glimpse of water. It filters through the trees, mixes with singing birds and windblown leaves, fades in and out as waves crash into the distant shore. It takes a moment for the sound to register, for my mind to pull it out from the catalog and recognize it as the sea. Then a crack of blue appears through the branches. It widens as I walk, matching the sound until the sea stands waiting in the distance, deep and blue, curving along the coast and stretching out to the horizon. Big waves roll into shore, the last shudders of some distant storm across the Atlantic. They rise into peaks, higher and higher until they collapse upon themselves, falling into piles of white foam that slide up sand beaches and spray off rocks. On and on they come, a rhythm of waves, rock, and sand beating like a heart. The last miles disappear. Muxía rises in the distance, clinging to the edge of the world on the neck of a small spit of land. The colorful buildings cluster together, huddled against the sea. A warm, afternoon light glows off the walls, making the colored paint pop. The town is quiet, sleepy, just yawning awake to prepare for summer, but even half asleep it is still the second of the Camino’s three endings. The first in Santiago. The second here. 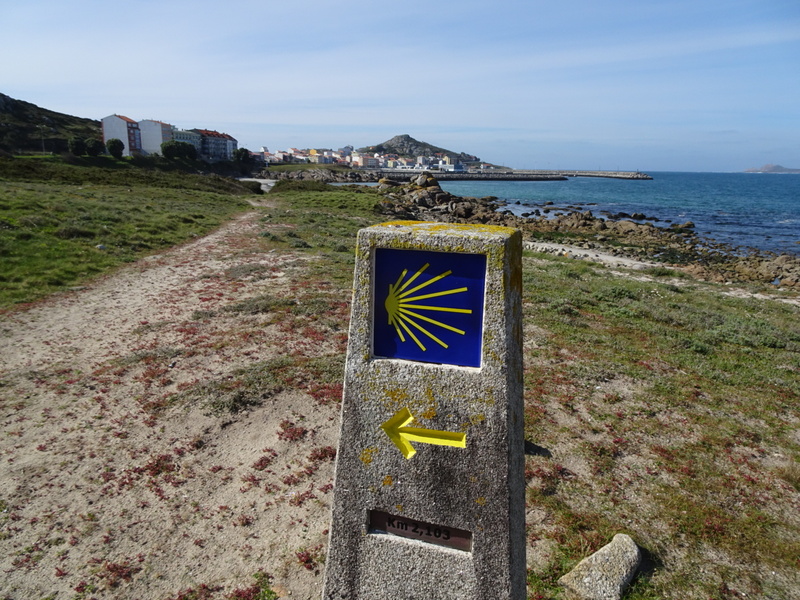 The third in Finisterre to the South, two days away. I reach the town along a curve of beach, leaving a line of footprints behinds me in the sand. When I order chicken from the butcher he tells me he walked the Camino once. A big smile spreads across his face, the edges tinged with sadness. Or is it pity for me, here at the end, because he knows the end is hard. He hands my order over the counter and wishes me luck. But this isn’t the end for me, I tell myself. I still have a long ways to go. I step back into the street to walk up to the albergue, to the kitchen, to cook dinner for my friends. Three more nights together. Just three more. Waves crash in the distance. I listen for a moment and wonder if they’ve already swallowed away my footsteps. Your words put me in Muxia this morning. Happy Birthday D! Oh, I sure do hate to think that your daily journal will soon come to an end. I guess I will have to return to the beginning and savor it once more. Thank you for bringing us along on your adventure! When you are nearing 80 years old, this is a fun way to travel. Now I am left to wonder about that tinge of sadness at the edges of the butcher’s smile…what’s his story? Did he find his life changed as he arrived in Muxía? Your writing in this episode was just lush. You are a beautiful writer.